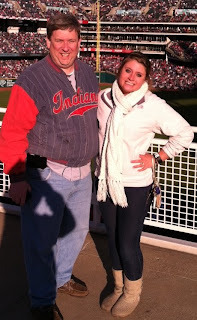 My oldest daughter got a job in marketing and starts in early August. Besides the fact that I'm pleased to see her removed from the ranks of the stereotypical underemployed college student living in her parent's basement, I'm proud she found a job in her field and in her hometown. She'll be working in Newark. It also causes me to reflect on the possibility and look forward (I think) to the day her job puts her in the same place or same meeting as me. It's bound to happen. I know that from my own past experience. I worked for the State of Ohio in 1991 and my father started in state government with a different agency a few months after me. We encountered each other more than a few times in the span of five years we were both in Ohio. I remember a meeting he led for ODOT on a railroad matter in 1992. I represented the Lt. Governor in the same meeting. A groundbreaking for an ODOT project in 1995 where my Dad and I both were on the agenda caused someone, jokingly, to remark, "Now I know why they call this a plat of land." Stay tuned. It will be a milestone when it happens.